What? | Grow See This. Last Spring while driving around the city, I was in a fairly constant state of adoration for every blossom that was in bloom, and every bud that was so swollen they were about to burst open and announce themselves. I could practically identify their individual voices as I drove around under Toronto's huge Maples trees. I was traveling north on Poplar Plains rd. when I first saw her. It was love at first sight. There she was in all of her glory, the most amazing, arching, billowing in the gentle breeze Magnolia that I had ever seen. I had to pullover, which is not very easy to do on a narrow one way street. Her Flowers were goblet shaped and light pink. 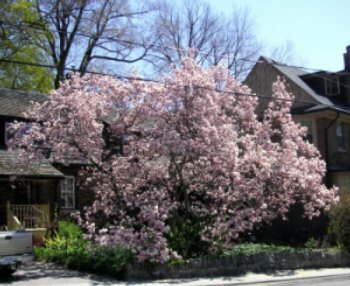 It is a common variety of Saucer Magnolia in the city of Toronto, and my guess is M. x soulangaena (M.denudata x M. liliiflora) (My spell checker is going red line happy right now!). As I sat there, full up with love for this tree, I thought to my self “WHAT CAN I DO TO LET EVERYONE IN THE WORLD SEE HOW BEAUTIFUL THIS TREE IS?” Well, I guess we got the answer. What I really want to do, but I need your help to do it, is create a Toronto gardening community, that includes the world. To allow inspiration to lead you off of your couch, and onto the lawn of the beautiful or unusual, Clematis, or tree fort, Japanese Maple, pergola, stone work, composition, ingenuity, ideas, colours, textures and sense of humour. The folks on my crew are all walking around the city with their own cameras keeping an eye out for gardens and plants that make an impression. I would love to see some of your photographs, and pretty soon my PDA will have a way for you to do that!